Since 1989, MIT professor Peter Hagelstein has been struggling to find a viable mechanism to explain LENR experiments. An applied physicist, as he calls himself (his degrees are in electrical engineering and computer science), he thought he had figured out the mechanism for "cold fusion" three weeks after the 1989 University of Utah fusion press conference. By 2005, he had tried more than 150 models in an attempt to explain LENR. But he didn't always pursue the "cold fusion" hypothesis. Hagelstein thought nonfusion, weak interaction, neutron-based theories "more closely match[ed] the experimental observations." He was very straightforward and did not attempt to use sophistry to co-opt non-fusion approaches as fusion. 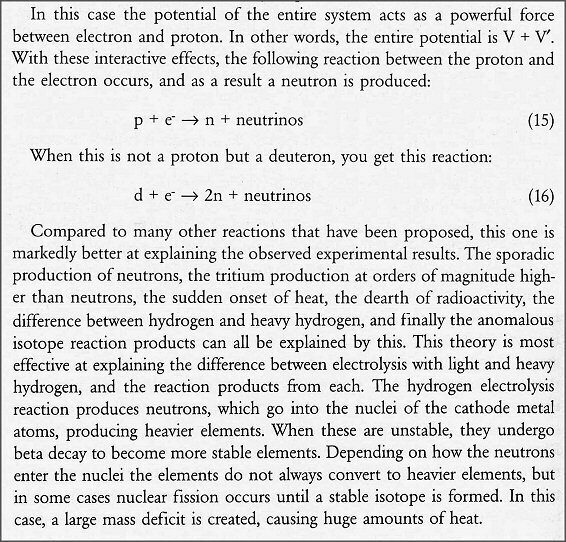 In the next paragraph, Hagelstein explains his interest in the nonfusion, weak interaction, neutron-based hypothesis. Even as early as 1990, Hagelstein was seriously considering weak-interaction processes that would create (virtual) neutrons. Hagelstein's 1990 theory involved creating virtual neutrons through the weak interaction. Presumably, he was not able to fully articulate the physics and mathematics correctly to develop a complete weak-interaction-based theory. Otherwise, he would have shouted his success from rooftops and claimed priority over Widom and Larsen, which he has not. Instead, there has been bitter antagonism between Larsen and Hagelstein. If Widom and Larsen end up being correct, Hagelstein, as well as Tadahiko Mizuno, Yasuhiro Iwamura and Mitchell Swartz, can take credit for the good instincts that led them to consider weak interactions and neutrons key to LENR. Images from papers of each of these authors are shown below. Mizuno weak-interaction inverse beta decay produces neutrons. Iwamura weak-interaction inverse beta decay produces neutrons. Swartz weak-interaction inverse beta decay produces neutrons. Neutrons produced by weak-interaction inverse beta decay were even mentioned by Larry A. Hull back on May 15, 1989, in a letter to Chemical & Engineering News. By 1998, right about the time when SRI International conducted its Case replication experiment, Hagelstein went back to pursuing fusion-based concepts. Larsen began looking at LENR in 1997. He traveled to conferences, met many of the researchers and appeared to have amicable relationships with all of them. But apparently nobody knew he was working on a theory until May 2, 2005, when he shocked his colleagues with a pre-print of a nonfusion theory paper that he and his collaborator Allan Widom had submitted to the European Physics Journal C.
Although many other people had intuited that weak interactions might create neutrons (Step 2 in the Widom-Larsen theory, or WLT), Larsen and Widom figured out an explicit mechanism (Step 1 in WLT) to explain how weak interactions would form such conditions. They used quantum field theory collective effects that create real, not virtual, neutrons. Widom and Larsen envisioned the neutrons as significantly less energetic than any previously known neutrons – for example, "ultra-cold neutrons," having an energy less than 10-7 eV. The ultra-low-momentum neutrons, as Larsen calls them, have an energy of 10-10 eV or less, according to Larsen. He says that the neutrons are born with such low energy because they are formed collectively as opposed to being formed in two- or three-body reactions. To explain "collective effects," he provides the analogy of a flock of geese, versus two or three birds, traveling through a turbulent storm. The third innovation to the WLT is the gamma to infra-red conversion process, which explains why there are little or no hard gammas emitted. The theory is difficult for experimenters to test because neutrons with such low kinetic energy will never travel beyond the surface of the cathode and thus will never be directly detectable. However, they may trigger spallation neutrons and thus be responsible for small fluxes of more energetic neutrons, as in the Bhabha Atomic Research Centre experiments. It is understandable that Widom and Larsen's competitors in the LENR field have been incredulous that WLT could have any, let alone full, viability. Widom and Larsen are outsiders. Widom probably has never set foot into a single ICCF conference. Larsen was previously known only as a business consultant and futurist. According to Barron's, he's had a track record of being dead-on with predictions. Perhaps some people in the LENR field have underestimated Larsen. What must be excruciatingly annoying to the other LENR theorists, particularly those who have been struggling since 1989 and paid many dues, is that people outside the LENR community, particularly in various branches and agencies of the U.S. government, have taken a liking to WLT. Months before Peter Hagelstein presented his "cold fusion" theory to the Department of Energy reviewers, Larsen had been invited to present at a Department of Energy/Electric Power Research Institute workshop. Larsen and his colleagues, in their paper in the American Chemical Society LENR Sourcebook (Vol. 2), mention that they have presented their work in a variety of places in Italy and India as well as "various U.S. government departments and agencies in Washington, D.C."
New Energy Times is aware of a few of these meetings. One was a Defense Threat Reduction Agency meeting on Dec. 12, 2006, in Ft. Belvoir, Va. Widom and Larsen were the only two speakers invited to present a theory of LENR. Neither Widom or Larsen, however, was invited to speak at a Defense Intelligence Agency workshop meeting on Aug. 4-5, 2009, at SPAWAR San Diego. Hagelstein, on the other hand, was invited and attended. Francis Tanzella, Michael McKubre, Mitchell Swartz, Pamela Mosier-Boss and Lawrence P.G. Forsley were also invited and attended. Pat McDaniel (University of New Mexico, retired from Sandia) presented an analysis of the WLT at this meeting. McDaniel was concerned that the WLT was wrong but, more important, that many people in the federal government are mistakenly accepting that it explains LENR. New Energy Times spoke with McDaniel and two of the organizers after the meeting. They all knew in advance that Larsen had not been invited. And rather than cite Widom-Larsen's published theory in the DIA report, the authors of the report included only an obscure reference (#43) to unrelated work performed by Srivastava and Widom, without Larsen. Such meetings help government officials understand science. This meeting did include some debate among the people who attended, according to one of the attendees. However, excluding Widom and Larsen from the opportunity to speak on their own behalf at this closed government meeting while including a critical review of their research by a third party was unprofessional. On the other hand, when the Army Research Laboratory held a workshop on June 29, in Adelphi, Maryland, Widom and Larsen were given a chance to discuss their theory. For unexplained reasons, however, Widom, who was scheduled to give the presentation, did not show up. Hagelstein spoke at ARL about several theoretical aspects of LENR, but he did not present a theory that explains LENR. Like Hagelstein, Yeong Kim, of Purdue, presented some mathematical ideas at ARL that he says can explain D+D "cold fusion." Kim finished his slide presentation with a cartoon depicting scientists at a chalkboard. Scribbled between two groups of calculations are the words "Then A Miracle Occurs." Kim's slide would be funny if it were not true. Interestingly, Steven Koonin, then with Caltech and now Under Secretary for Science at the Department of Energy, and his colleague Michael Nauenberg with University of California, Santa Cruz, also had an idea—apparently intuitive—just two weeks after the Fleischmann-Pons announcement that preceded the Widom-Larsen heavy-mass electron idea. 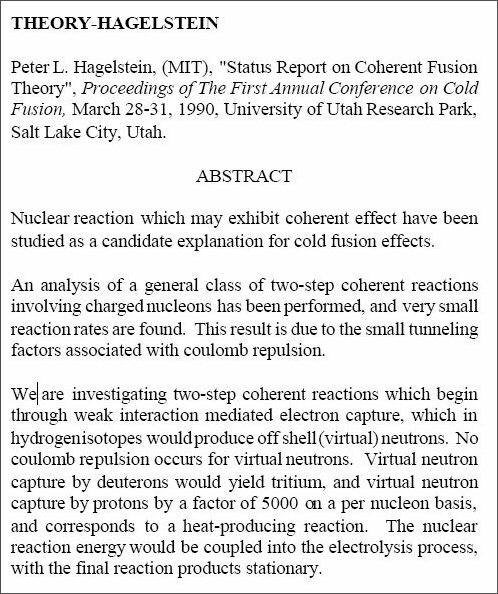 On April 7, 1989, Koonin and Nauenberg—who is experienced in particle physics, condensed matter physics and astrophysics—electronically circulated a pre-print of their theoretical idea of "cold fusion." They postulated that local electrons with substantially enhanced masses would lower the barrier to fusion with screening. 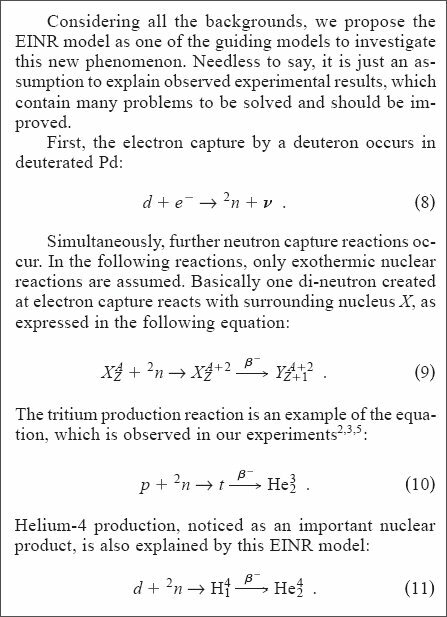 Apparently they only considered strong interactions rather than an electron + proton (or electron + deuteron) weak interaction.